Do you have a broken household item? Don’t toss it! Bring your small appliances, computers, electronics, clothes, jewellery, books, and more, and we will show you how to fix it for free! Find out more below. 1. 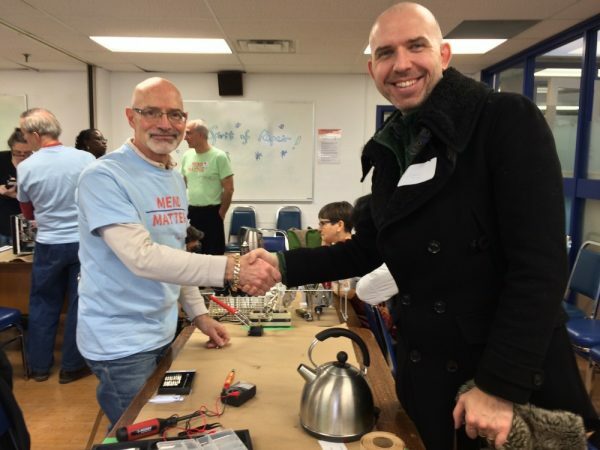 When and where is the next monthly Repair Café? Check the calendar in the sidebar for the next event. Click on the highlighted date to see event location and time. To avoid lineups, come early. Registration closes one hour before the end of the event. 2. What kinds of household items can I bring to the Repair Café? At the Repair Café in March, we will have fixers with expertise on repairing computers, electronics, small appliances, clothes, jewellery, book and paper repairs, toys, among others. And they can fix many other household items as well. So just bring it on. 3. How many broken items can I bring to the Repair Café? There is no limit but to reduce the waiting time during busy periods, a maximum of ONE broken item per person will be examined. If it is busy, you can take a number and, while you’re waiting, have a friendly conversation with your neighbours. Fixers are volunteers who are skilled at repairing household items. The team of fixers at the Repair Café has a variety of expertise, from appliances, electronics, appliances, furniture, clothes, jewellery to books, among others. Your fixer will show you how to repair your item and work with you to get it fixed. Or you can request advice and guidance and carry out the repair yourself. He or she will help you learn basic skills by sharing his or her expertise and demonstrating how you can gradually repair broken items on your own. Please note that REPAIRS ARE NOT GUARANTEED. In addition, please respect that our focus for clothing fixes is on repair rather than alterations. 6. 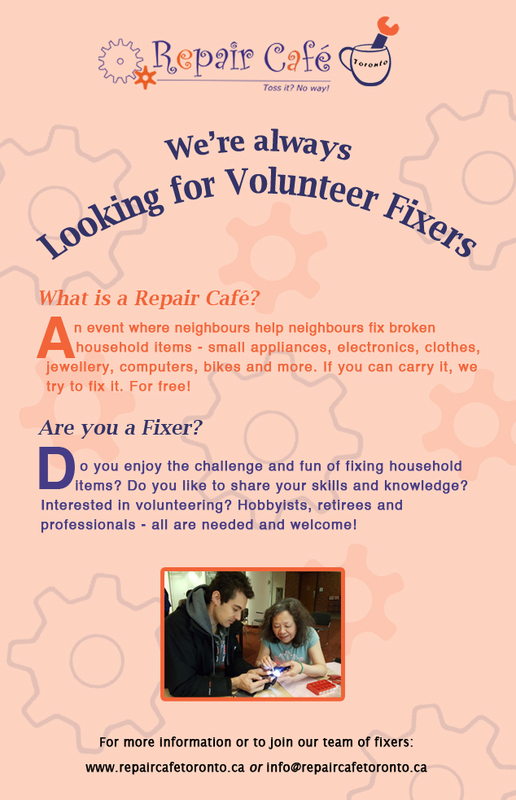 Is there any cost involved on repairs at the Repair Café? The work carried out at the Repair Café is done free of charge on a voluntary basis by the fixers available. At the moment, we cannot provide replacement parts such as plugs, fuses, zippers, etc. If you are satisfied with your experience at the Café, we will greatly appreciate it if you are able to make a cash donation at your discretion. This is just to help cover our costs. All fixers are knowledgeable with regard to the safe use of the tools available. The first step in tackling a repair job will be to discuss the safe use of tools and handling of the item to be repaired. Electrical safety will be explained when disassembling items that use electricity. 8. How do I register for a repair? Sign-up is “first-come first-served” on the day of the event. We don’t use a pre-event registration system. Registration is open up to 1 hour before closing time. We suggest that you arrive on the early side to ensure your place in the queue. 9. Can I visit the Repair Café if I have nothing to repair? Yes! 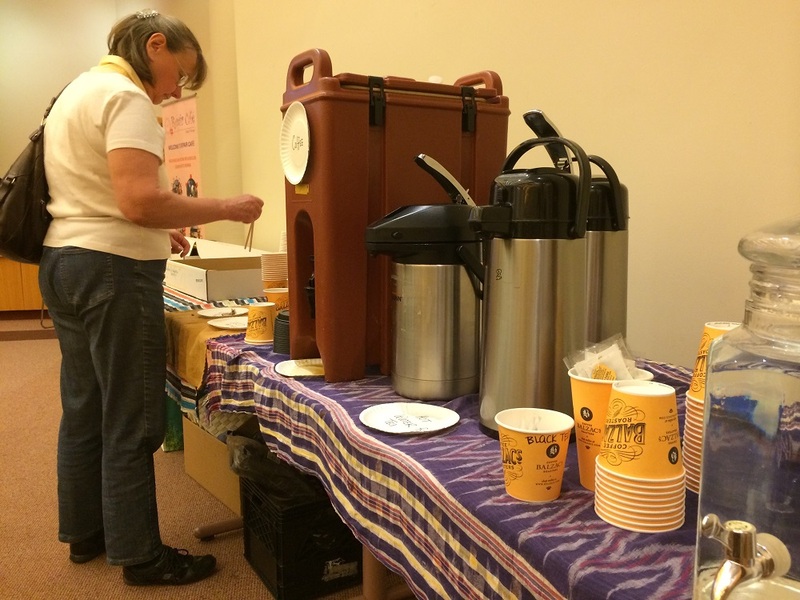 You can still enjoy a cup of coffee/tea, catch the vibe, or lend a hand with someone else’s repair job. 10. How to receive news about the Repair Café?